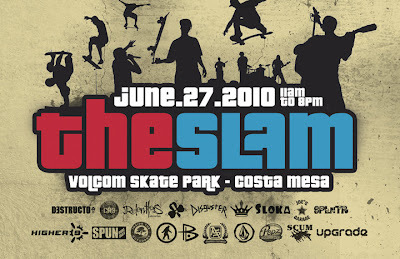 I recently met Seth Elson to speak about The Slam, the contest he is organizing on June 27th at Costa Mesa Skatepark. 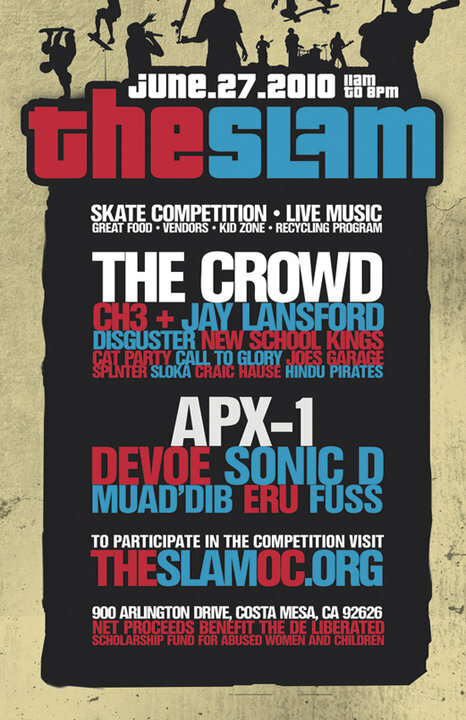 But as we were chatting on the top floor of the Vans skatepark, eavesdropping on the few pool-riders venturing on the Combi that day, I learned that Seth is more than the promoter of The Slam and the interview that was supposed to take 30mn lasted 2h ½. Seth has been skating at a high level since 1974. . He was there when the original Combi was built at Upland and when it was destroyed; he was there at the time of the Z-Boys, the Ranch, the Bones Brigade, The X-Games and the Pool Party. That’s a 35 year span. We stopped talking exclusively because it was late in the night but many questions were still unanswered. ISTIA: When did you first start skateboarding? Seth Elson: I first started skateboarding when I was about 5 ½ years old. I started with a Black Knight, clay wheels and my 1st park was Concrete Wave back in 1974-75. ISTIA: What got you into skateboarding? Seth Elson: I saw it on TV when I was a little boy and I immediately fell in love with the freeness that skateboarding would give you as far as been able to being able to really go fast. When I got my hands on skateboard that was it. A neighbor had given me and old deck and I just absolutely fell in love with it. It’s actually been my entire point for being through my entire life. It’s all I ever lived for and you know, I would rather skate than work! ISTIA: Did you ever stop? Seth Elson: I had a point in my life when I dislocated my knee in the Combi and it took me out for about 2 years. 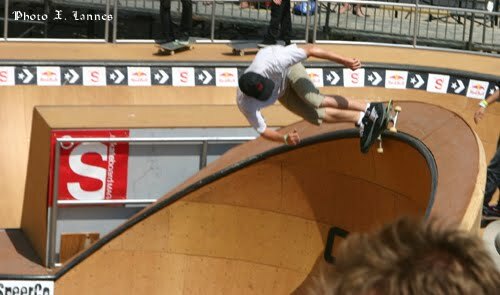 That was the 2nd year the (Vans) skatepark was open. ISTIA: And you never stopped between 1974 and 2002? Seth Elson: No, I’ve been skating steady. Like I said, it’s been my whole reason for being. My life was always centered around skateboard and to a lesser extent punk rock music, just being a fan because when I was growing up during my informative years, punk rock and skateboarding were hand in hand. It was just very natural for me to follow. I used to do contests, back in the 90’s I skated the whole Castle series I skated regularly and even in 91. I place 6th overall in the state of California which was my biggest claim. But now, mostly, I just skate for the love of it. ISTIA: With whom were you skating at the time? Seth Elson: I have skated side by side with everybody from Dave Andrecht, Brad Bowman, Gator, everybody all the way to Omar (Hassan), Bucky (Lasek) Jeff Grosso, and all of the current pros. I’m friends with a lot of them. My skating career really covered the entire skateboarding history of Southern California. ISTIA: Having started in the 70’s, I guess you are more into vert? Seth Elson: Yeah. I like bowls! I’m a big fan of mid-ramps and bowls, wooden and concrete. That seems to be my preference. But whenever I skate vert, I break. Whether it’s a wrist, an ankle, a knee. I always got to be hurt and that’s why they call me Seth of Death. ISTIA: At one point, there was no more ramps, no more pools, no more skateparks or very few of them, so where did you skate? 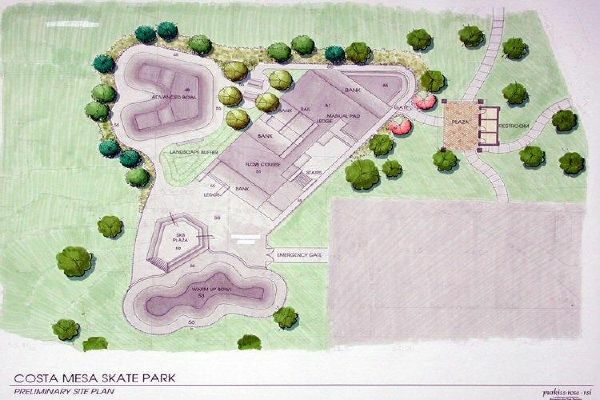 Seth Elson: We would either build stuff or we would find stuff to skate. Back when the parks closed and all the terrains dried up, that’s when backyard ramps really started coming out of age. Structures were starting to become standardized people learned how to make ramps, in a cost effective way and so that’s when the ramp skating really took off in the 80’s and the 90’s. ISTIA: It that where you knowledge is coming from for building ramps? Seth Elson: Yes sir! That and I am a mechanical design engineer by trade so it’s all natural for me. ISTIA: I saw some of your ramp drawings, is that what you do? Do you work for a company that is designing ramps? Seth Elson: No. At this time, I am a free lance mechanical design engineer, right now my most current career has been in the action sports industry having designed the Rockstar portable vert ramp, that is on the Journey’s Backyard BBQ tour right now, the Red Bull bowl, that debuted on the sand at Hurley pro in 2009; a bunch of stuff for Travis Pastrana and his Nitro Circus crew for MTV, a couple of portable ramp FMX takeoff and landing structures for Metal Mulisha that toured on the 2007 Nascar racing circuit. My stuff’s has also been on Conan O’Brian. I also specialize in OEM automotive and I am an automotive designer. I designed products for Nissan, Ford, Mazda, handling quality issues and basically set up a fortune 500 Japanese company here in the United States and got them all qualified with the US OEM, I also do product design, anywhere from retail to biomedical. So pretty much over a whole spectrum of design. ISTIA: How much time is designing ramps taking you? Seth Elson: Yeah, it’s not bad. I’ve been dealing with the action sports industries, as you know; skaters are skaters you have to be able to deal with the skater’s mentality in getting paid. 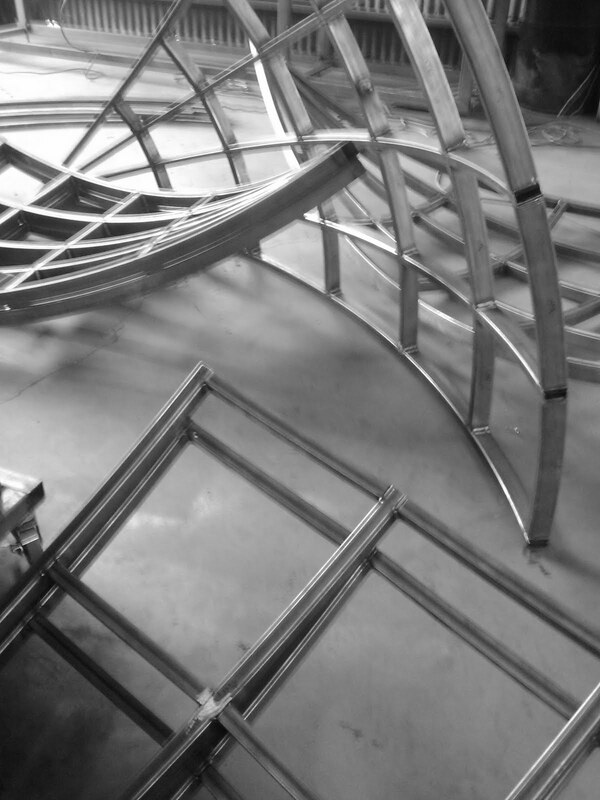 So it’s very rewarding and fulfilling to be able to create a structure but it’s a tough industry. There are only a couple of companies in the country that do it and you have to be able to deal with them or you have to stake your own claim on the market and I’m slowly starting to stake my own claim. 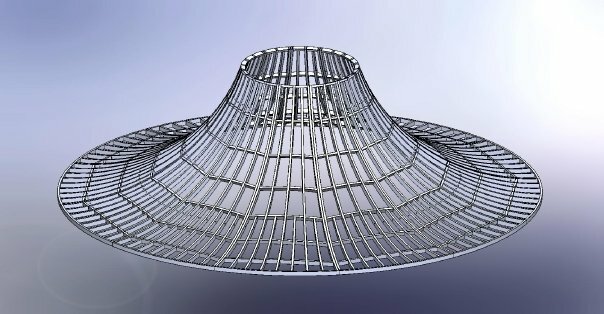 Seth Elson: There’s a whole infrastructure out there that need support and that the kids can find a niche in it, anywhere from mechanical design, engineering, mathematics, physics, essentially with the new materials that’s coming out there that really involves the science behind the scenes of the skateboard world. Product design, literature, graphic arts, business management, purchasing, there is a whole slew of career choices in the skateboard industry. You don’t have to be pro to work in the skate industry. You just have to have the drive. ISTIA: Can you make a living by just designing ramps? Seth Elson: In an ideal world, yes you could, but because of the nature of the economy right now, it is very difficult. It has actually been my goal for the last 5 years, is to try to establish a full time position within the industry and it has been a rough road. Its’ mainly because the amount of customers that are able to purchase high quality portable ramps structures are very limited. 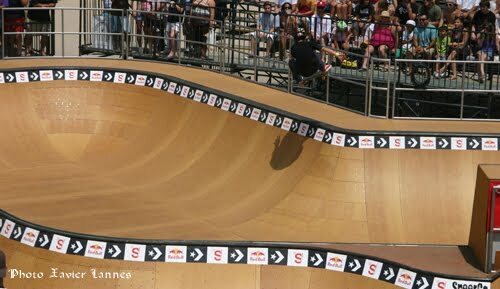 The amount of money that is needed to create high quality structures such as what Rockstar, Redbull, Metal Mulisha have had us develop is not really around right now. It is very difficult but I’ve been trying for 5 years and it has added a decent stipend to my regular work. ISTIA: Where is that ramp now? Seth Elson: No!. Laughs… Though it is due to make another debut on the sand this year as far as I know. ISTIA: So you say it’s unassembled? Seth Elson: Yes, it is unassembled. The thing is, that when I was growing up, I played with Legos day and night. It’s what got me into engineering and taught me to think in 3 dimensions. 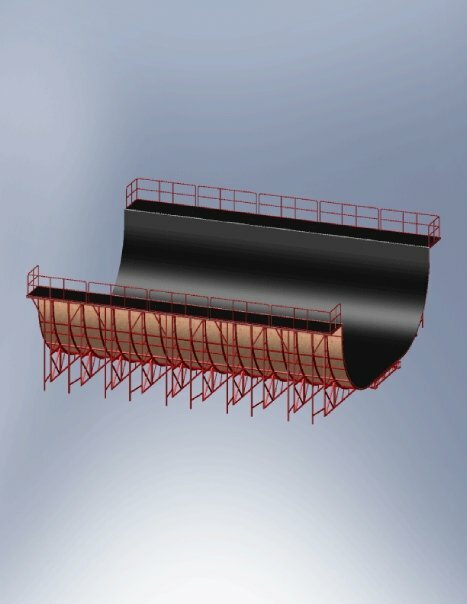 So I tend to design ramps like Legos. It pulls apart modularly, stores in carts and it is totally portable. The RedBull bowl can actually be configured out in any one of 15 different combinations. ISTIA: How many ramps have you designed? Seth Elson: I would say I have designed around 20 ramps. Small stuff or such some as the bigger stuff as I mentioned. ISTIA: What was the biggest? Seth Elson: That would have been the Rockstar vert ramp it was 14 ½ feet tall, 45 feet wide 50 feet long. ISTIA: How long does it take to built ramp from scratch, from conception to 1st ride? Seth Elson: It depends on the complexity of the ramp. It can take anywhere from a few hours to 4 to 6 months from conceptualization to actual implementation of the structure. Seth Elson: It’s a lot of work. The Rockstar ramp I have probably put let’s say close to a 1000 hours into it just because of design revisions, going back and forth making sure everything is ok, finalizing the design, and just all of the variables that you have to take into account when designing a structure like that. That’s 39,000 pounds of steel. ISTIA: What would be the cost for a ramp like that? Seth Elson: About 200 grand. Seth Elson: Yeah, that’s a lot of money. It’s big though. Seth Elson: No, I never had the chance. The first set up was at Oakley a couple of years ago for a demo that they were doing and it was raining so I did not get to skate there then it went into a truck trailer and it disappeared for like a year where nobody knew where it was and all of a sudden it’s back out. They do a yearly tour called the Journey’s Backyard BBQ and the ramp is out on their tour right now. It was just in Nashville 2 weeks ago. ISTIA: What would be the ramp you are most proud of? ISTIA: What is the background to build ramps, being a skateboarder first? Seth Elson: Sure, you have to know what is skateable, to design something good and that people will like. Seth Elson: You have to have a love of the sport and then, on the engineering side you have to be able to visualize in 3 dimensions. You have to be able to conceive a complex design in your head. I always say that people who think in 2D are like normal people or at best businessman, you know, linear thinking. But every engineer that I know that’s good thinks in 3 dimensions. You have to be able to think spatially. That goes with a larger global picture but I would say you have to love the sport , you have to be able to have an aptitude for things that are mechanical in nature and you have to be able to translate your thoughts from your brain to your hands. You have to be able to make that connection because I know a lot of engineers that are good but they can’t change their own oil in their own car. It always seems to mystify me because I do all my work on my car and I design ramps. ISTIA: Do you have a ramp in your backyard? ISTIA: Do you design pools too? Seth Elson: I can, I can do 3D complex surface modeling..
ISTIA: Let’s talk about The Slam at Volcom Park. 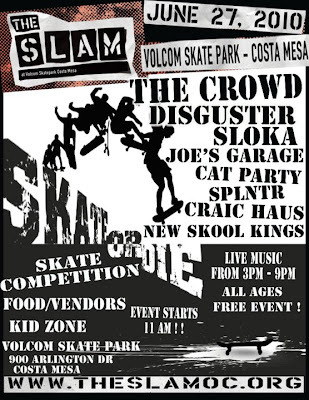 Seth Elson: The Slam is a charity fundraiser that takes place on June 27th at the Volcom Skatepark at 970 East Arlington in the city of Costa Mesa. It’s behind the fairgrounds; Volcom donated a chunk of cash to get it built a few years back. It’s a fun park. We are doing this to help raising money for a charity scholarship funds named De La Libertad scholarship funds. The scholarship funds awards two year and four year scholarships for women and children from abusive households. We are a fiscally sponsored project from the Volunteer Center-Orange County and our scholarship funds is administrated by Human Options in partnership with HEEF which is Hispanic Equal Education Funds. ISTIA: Who got the idea to do that? ISTIA: There is no skatepark in Santa Ana! 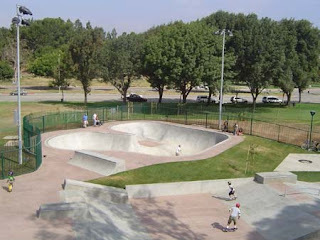 Seth Elson: There is a skatepark in Santa Ana called Centennial skate park and it’s a street park. It’s one of the first concrete parks of this new era built back in about early 90’s. It’s good for street skaters but that’s all it is. 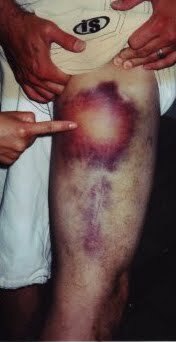 I actually got really hurt in it (laugh). That’s why I stick to transition skating. I’m no kickflipper. When we started with Santa Ana we thought of Centennial and that’s probably where we are gonna have the next one. Seth Elson: An experienced skater is anybody who feels comfortable to enter into a competition within a group of individuals which are their peers or above or below. ISTIA: How many people do you expect? Seth Elson: We are hoping for at least 75 contestants. I think it would make it a good contest. 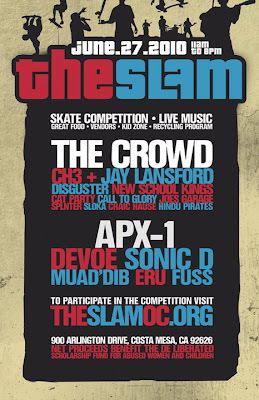 My business partner has worked out all the contest details and we have posted all of them up on the website (www.theslamoc.org). We were just made aware that there’s a bad sun gouge at the park during a certain time of the day so we are redefining the layout of the contest to make sure that that sun gouge will not negatively affect any portion of the contest. But as far are we are concerned as many as we can get to skate that just make it much more fun. ISTIA: How are you gonna do it with the spectators? Seth Elson: We have 3 bleachers coming in, roughly anywhere from 16 foot to 20 foot wide. There will be bleacher risers, people will be able to sit on the straw bales that will be on the bleachers as well as spread around the event. We will be reserving the in-place bleachers at the park for handicapped and special needs children and adults. It is a A.D.A. (Americans With Disabilities Act) requirement and we need to be compliant. People can bring blankets to layout as there’s a large area where you can have a picnic type of atmosphere. ISTIA: How about the music? Seth Elson: We have 6 DJs from the Long Beach and L.A area and they will be spinning typical house, jungle and new school and that will take place during the street contest during the day. We also have 10 bands playing, starting at around 2pm. We have the Crowd, Channel 3, Disguster, Sloka, New Skool Kings, Cat Party, Call to glory, Joes Garage, Splnter, Craic Hause and Hindu Pirates. ISTIA: What’s the Battle of the Zones? 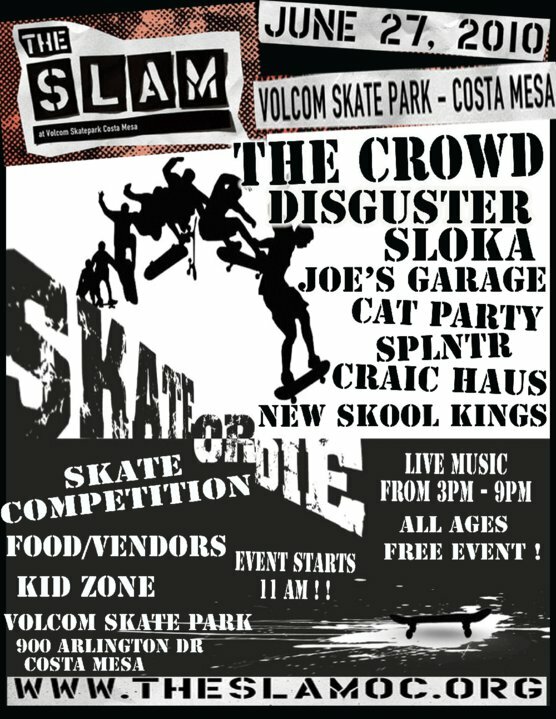 Seth Elson: The Battle of the Zones is a contest between 4 Costa Mesa high schools I am a board member for the Orange County Skateboard League and I’m actually the director of special events and the 1st part of The Slam the contest is pinning each school against each other. They have come up with a name called Battle of the Zones because it’s a term that they use for other interschool competitions and basically, the school are going to battle it out to see who the best team is so it fosters individualism within the schools of skateboarding but it also fosters a team mentality to help kids be able to lean on each other. ISTIA: When was the League created? Seth Elson: The date of inception was 2010 and we are a 501C3 nonprofit, licensed and registered with the State of California and the IRS and we are taking donations. Katrina Foley who is a council person for the City of Costa Mesa, Jim Gray, Marty Jimenez and other folks were the original founders of it. I came on-board when The Slam was created and offered to add my services, my design skills and my event promotion skills to the League and I thus became a voting board member. ISTIA: There are 4 schools and how many kids? Seth Elson: We are still working on that right now, but I think we have anywhere from 40 to 60 kids. And that’s just for high school. The goal is to bring it to every Orange County middle and high school into the league and that’s why I joined the board because to have something like that and I’m sure you can relate has always been a dream. Can you imagine going to Junior High School or High School and signing up for skateboarding that gives you PE credits? I can’t even imagine it! Pictures courtesy of Seth Elson, The Slam, X. Lannes and private collection.